- Ellie has done incredibly well in our new house. I didn't ever think she would have that rough of a time, but the thought did cross my mind a couple times. She is just so excited to be in our new house and luckily being in a new bedroom hasn't effected her sleep at all! Hooray! She was very helpful on moving day as you can see (lol)...dancing away in the midst of all the chaos. This picture absolutely melts.my.heart! - Moving on Mother's Day weekend was not ideal, but it wasn't as horrible as I thought it would be. My Mother's Day present from my hubby was that I could tell him everything I wanted hung and he would get it all done on Sunday. It was actually a dream come true! Usually when we move, I am begging him to hang things for me, and it usually takes close to a month to finally get the decorating and organizing finished! Because of this Mother's Day "gift" to me, everything was put on the walls in one day! Hooray! I promise to post pictures of our new place soon, but I refuse to take pictures until everything is perfect....because I'm just kind of a perfectionist like that! - A little rant...I am so tired of high maintenance people...some people have such a sense of entitlement. Be a little more laid back people! Chill out and think about other people before putting your "oh so important needs" first! Learn to go with the flow a little bit! UGH! - 400 followers?? Woot woot! I am so humbled and honored that so many people have chosen to follow little 'ol me! I have met some amazing gals through my blog...and there are a handful that I seriously wish would move closer to me so that we could be amazing real life friends. I live in a pretty cool city and I promise you gals will all absolutely love it here! Lol! - I can not wait for summer! If any of you have been following me long enough, you know that I have a love affair with summer time. I love everything about it! The warm weather, the fun activities we plan, the picnics, the BBQ's, and pool days...and let's not forget the homemade sangria that the hubs makes (Tiffany...you would LOVE it!). I created a summer bucket list last summer and I think I definitely need to do that again. I think I'll let Ellie add a few things to our bucket list since she's a little older and can probably understand the concept this year...although, it might be scary to see what she adds to the list! ha ha! - We are on a search for a new dining room table...we didn't bring our old one with us to our new house. It was a super, super cheapo one and it was in no shape to join us in our new place. Do you know how hard it is to find an affordable, yet nice table? I have this vision for a rustic, vintage table in mind and we absolutely can't find something like it under $1k! I've been scouring the internet and Craigslist for weeks now and can't find anything I like in our price range. UGH! - Work is burning me out...and I need a vacation! I have over 9 more weeks until my assistant comes back...and she might not even come back when she was originally expected (her baby is still in the NICU, with no improvements in over a week. She's so tiny, and still can't eat or breathe on her own, so she might be there for the long haul). I absolutely love working for a small company for so many reasons, but these past 3 weeks without my assistant has taught me the one big downfall...when one employee is missing, it completely changes the dynamics of the office! - I was doing so good waking up early to work out...then I took some time off because I was staying up so late to pack and move...and now I just can't get back into the groove. Once you stop, it is SO HARD to get back into the routine! - If you follow my other blog, you can see pictures of Ellie every day...notice a trend? She wears a skirt, or a dress literally every day...even to bed! And of course, the fluffier the better for her. It's adorable, but at the same time sometimes a dress or a skirt just isn't suitable for certain situations. Sometimes you just gotta wear pants, kiddo! But of course...she's 2.5 (that explains enough doesn't it? )...and she hates pants...and a huge tantrum usually ensues if I try to force her into them. So, I pick my battles, and let her wear her beloved skirts...all.the.time. I'd rather fight with her over eating her fruits and vegetables rather than fighting over wearing the same skirt for 4 days in a row! 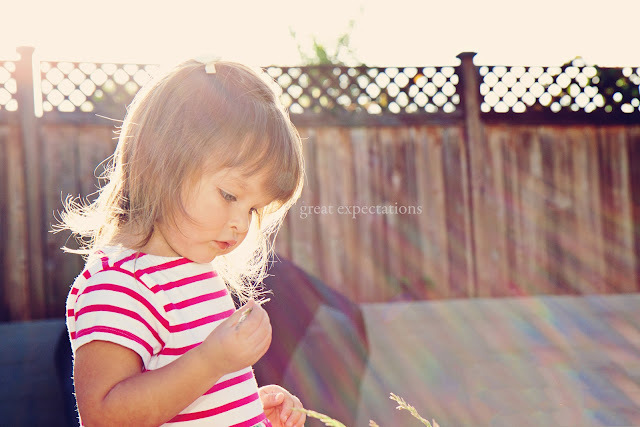 I absolutely love the pictures on your other blog... seriously, Miss Ellie is honestly the most precious kid ever! Can't wait to see pictures of your new place. I bet it is lovely! I loved this post! It's nice to be caught up on what's going on with you all! And it's so true about a small office! I'm at one too and it can get tricky and stressful when someone is missing! Your blog is so CUTE, really like it! AHHHHH! Even though we still keep in touch... I'm SOOOO freakn/flippn HAPPY your back mama! Gosh. I love all your random thoughts, you make me laugh. You should make this a regular thing! Can't wait to see house pics! Lol... Kyna... are you kidding me! Do you know the happy dance my heart would dance... if I had a little sweet girl who ONLY wanted to wear fluffy skirts!! Hahaa... yes PLEASE! LOVE you mama. Can't wait for an email from my bbf!! Glad the move went well, and you got everything hung. The first photo melts my heart also. Thanks for the flattery re my blog. Your always leaving me sweet comments. Thank you, they make me happy. Hi Kyna! I'm new here and I'm LOVING your blog already. Your little one is beautiful!! I feel ya on the move situation. We just went through a move (with our 2 year old boy) and I was so stressed out about it, and he handled it really super well! Kiddos are so resilient, and oh boy, I thank God for that!! Hello Kyna! Welcome back and you really make up through this long and meaningful post. Belated happy mother's day too. I'm one of your followers who would love to see pictures of your new home.